What fuels long-term business success? Not operational excellence, technology breakthroughs, or new business models, but management innovation--new ways of mobilizing talent, allocating resources, and formulating strategies. Through history, management innovation has enabled companies to cross new performance thresholds and build enduring advantages. 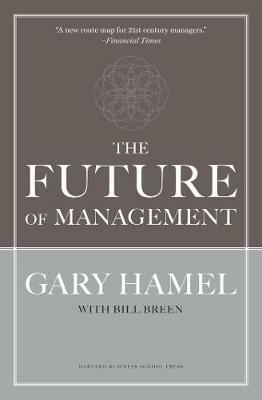 In The Future of Management, Gary Hamel argues that organizations need management innovation now more than ever. Why? The management paradigm of the last century--centered on control and efficiency--no longer suffices in a world where adaptability and creativity drive business success. To thrive in the future, companies must reinvent management. Hamel explains how to turn your company into a serial management innovator, revealing: The make-or-break challenges that will determine competitive success in an age of relentless, head-snapping change. The toxic effects of traditional management beliefs. The unconventional management practices generating breakthrough results in "modern management pioneers." The radical principles that will need to become part of every company's "management DNA." The steps your company can take now to build your "management advantage." Practical and profound, The Future of Management features examples from Google, W.L. Gore, Whole Foods, IBM, Samsung, Best Buy, and other blue-ribbon management innovators. Gary Hamel is Visiting Professor of Strategic and International Management at the London Business School. He is the author of Leading the Revolution and coauthor of Competing for the Future.